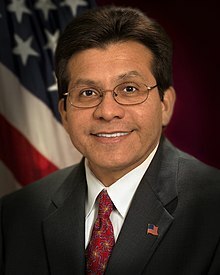 Alberto Gonzales (born August 4, 1955) is an American jurist who is the 80th Attorney General of the United States. 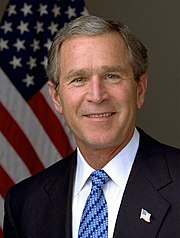 Gonzales was appointed to the position in February 2005 by President George W. Bush. While Bush was Governor of Texas, Gonzales was part of his general counsel, and later was the Secretary of State of Texas and then was on the Texas Supreme Court. From 2001 to 2005, Gonzales served in the Bush Administration as White House Counsel. On August 27, 2007, Gonzales announced that he is quitting his position as Attorney General, and that his last day will be September 16, 2007. He did not say why he is leaving. He is the highest-ranking Hispanic ever in the United States federal government. ↑ Meyers, Steven Lee (August 27, 2007). "Embattled Attorney General Resigns". The New York Times. Retrieved 2007-08-27.